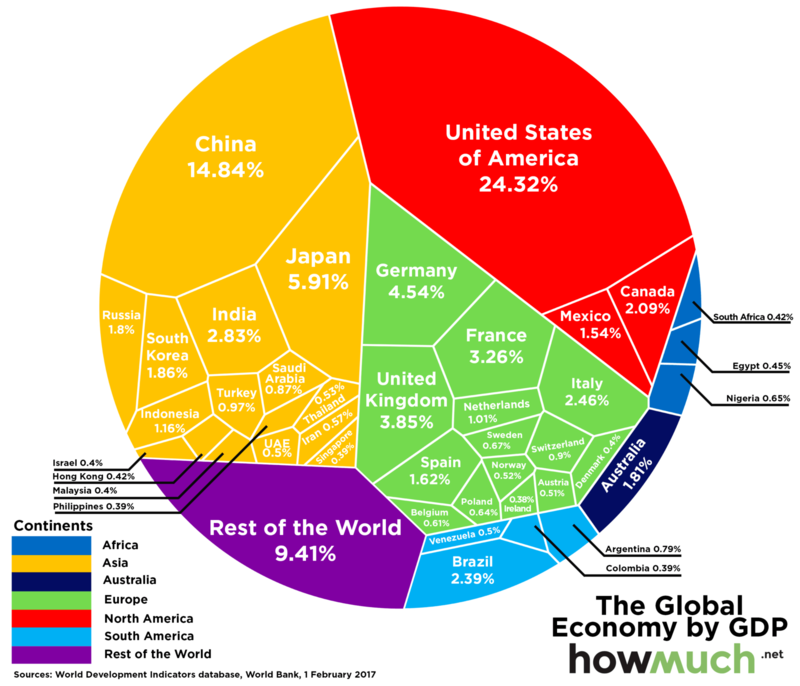 The global economy is unsustainable in the long run, both because of the inherent contradictions within capitalism and the finite nature of the world’s resources. It almost went down during the 2008 economic crisis, and the American and other bailouts were just temporary fixes. Additional austerity measures have been politically resisted by the left in Greece, Spain, and other European countries, and reacted to by right-wing parties targeting immigrants. In “World economy: the return of crisis” (International Socialist Review, Fall 2016), Joel Geier and Less Sustar say, that in the United States, “the Obama administration’s $787 billion stimulus program focused on propping up the financial system while cash-strapped state and local governments slashed spending. The Federal Reserve drastically lowered its main interest rate and bought up the banks’ holdings of US treasury bonds. When that wasn’t enough to spur the banks into lending, it went on to buy enormous amounts of the banks’ dodgy mortgage-backed securities. In Europe, the transfer of bank and private sector debt to public debt increased it to such a level that some states, like Greece and Portugal, were unable to borrow more money by selling new government bonds. To limit borrowing, those governments introduced austerity measures, or were forced to do so by the ‘troika’ of the EU, the IMF, and the European Central Bank (ECB). (In the pre-eurozone era, those countries would have had the option of devaluing their currencies to try to export their way out of the slump by making their products cheaper on the world market. Members of the 19-country eurozone have no such option – they’re locked into whatever policy that the German-dominated ECB permits.) The aim was to ‘restore confidence’ and ensure that European banks got their money back no matter what the social cost. This was the context for the ‘Leave’ campaign for Brexit, an alliance of the anti-immigrant right with British capitalists convinced that a future outside the crisis-bound EU was a better prospect. In the US, the economy and rising inequality fueled both the rise of Donald Trump’s anti-immigrant ‘Make America Great Again’ campaign and Bernie Sanders’s unexpected success in reintroducing socialism into mainstream US political discussion for the first time in decades. Eight years of easy money have created enormous amounts of what Marx called ‘fictitious capital’: speculation and the valuation of real and paper assets at higher levels without a corresponding growth of underlying productive capital. It had been hoped that easy money policies would inflate assets sufficiently so that wealthy people would make larger investments. This was then supposed to trickle down to workers and the middle class by creating jobs and generating consumer demand. Instead, there were mammoth asset bubbles throughout the world in stocks, bonds and housing. The $2.4 trillion parked offshore by US corporations to avoid taxes highlighted this reluctance to make investments. When the crisis of 2007-09 began, Chinese banks didn’t feel the same financial shock as their Western and Japanese counterparts, because they had more than $2 trillion in foreign reserves, enabling the Chinese leadership to provide both credit and stimulus. In fact, it was the Chinese government’s $590 billion stimulus program in 2009 – proportionately much bigger than that of the United States – that did the most to blunt the world crisis. Prices of commodities and energy soared, giving a big lift to emerging markets and boosting the economies of commodity-producing countries like Russia, India, China, and South Africa,” known collectively as the BRICs [Brazil-Russia-India-China]. On the other hand, “China has $16 trillion in corporate debt, 160% of GDP – twice the ratio in the United States, a growing risk for the world system. A worldwide crash in commodity prices began in 2013 and stabilized only in mid-2016 as the Chinese stimulus worked its way through the world system. Oil dropped 75% between 2014 and early 2016 from $120 to $30 per barrel before it recovered, and the pattern was similar for copper, aluminum, and other raw materials, an indicator of the slowing demand for industrial production on a world scale. Commodity producers’ high profits turned to catastrophic losses almost overnight. The world’s leading oil exporters also found themselves in a devastating price war, as Saudi Arabia ramped up production to maintain market share at the expense of OPEC members like Venezuela and Nigeria and the oil and gas boom in the United States. With the plunge in commodity prices has come a sharp slowdown in world trade, which has never fully recovered from the Great Recession. The US economy, despite steady job growth, has struggled to attain a 2% rate of growth since the end of the Great Recession, compared to 3.5% annual growth in the period since the World War II. Investment remained low by historical standards. The Wall Street Journal noted: ‘Companies appear reluctant to step up spending on the basic building blocks of the economy, such as machines, computers and new buildings.’ Low investment begat miniscule gains in productivity, the foundation of profitability. The latest stimulus spending in China may keep the global economy from a further slowdown, but only at the cost of adding to growing debts, worsening overcapacity, and tensions over trade, thus preparing the way for a potentially worse crisis. Low interest rates have also constrained bank profits, particularly in Europe. If the banks are having difficulty in a zero-interest world, other financial institutions are staggering towards crisis. The business model for pension funds and insurance companies requires them to generate income of 7–8% per year, so continued low interest rates threaten their solvency in coming years. To try and eke out larger reserves, many pension funds and insurance companies have been compelled to take on more risk, such as collateralized mortgage obligations and bonds from emerging market economies, countries that now in crisis as the result of the crash in commodities prices. It’s highly probable that the economic slowdown in emerging markets will trigger a financial crisis. The only question is when this will occur and how severe it will be. It’s impossible to predict, as the unregulated shadow banking system – the non-bank financial institutions that played a central role in the crash of 2008 – is now bigger than ever. How will governments and capitalists respond to a new slump, since their traditional methods have failed? Whatever capital comes up with to restructure the system will be complicated by the rise of economic nationalism exemplified by Trump, Brexit, and Le Pen. In the 2008–09 crisis, the Group of 20 industrialized nations coordinated stimulus spending and bank bailouts, narrowly averting a 1930s-scale slump. Today, however, governments pressured by nationalists and burdened by huge debts may be unable or unwilling to cooperate on similar measures. A more recent International Socialist Review article on this subject, by Ashley Smith in the Summer 2017 issue, updates all this from the point of view of imperialism. Smith notes that Obama tried to counter the Bush administration’s failures in Iraq and Afghanistan by conducting “a ‘pivot to Asia’ to contain China’s ongoing rise, bolster Washington’s political and military alliance with Japan and South Korea, and prevent their economic incorporation into China’s growing sphere of influence. The now dead Trans-Pacific Partnership was meant to ensure American economic hegemony in the region, which would then be backed up militarily with the deployment of 60% of the US Navy to the Asia Pacific region. Obama also began to push back against Russian opposition to the EU and NATO expansion into Eastern Europe – hence the standoff over Ukraine. Obama was unable to fully implement any of this, however, because US forces remained bogged down in the spiraling crisis in the Middle East. Retreating from the Bush administration’s policy of regime change, while continuing to support historic allies Israel and Saudi Arabia, he struck a deal with Iran over its nuclear program. This strategy was undermined by the Arab Spring, the regimes’ counterrevolutions, attempts by regional powers to manipulate the rebellion for their own ends, and the rise of ISIS in Syria and Iraq. Russia, after having suffered a long-term decline of its power in the region, has also managed to reassert itself through its intervention in Syria in support of Assad’s counterrevolution. While the United States continued to suffer relative political decline internationally, China and Russia became more assertive. Russia took Crimea, and China intensified its economic dealmaking throughout the world, increasing its foreign direct investment from a paltry $17.2 billion in 2005 to $187 billion in 2015. At the same time, it engaged in a massive buildup of its navy and air force (though its military is still dwarfed by the US) and constructed new military bases on various islands to control the shipping lanes, fisheries, and potential oil fields in the South China Sea. Trump’s strategy to restore American dominance in the world is economic nationalism. He wants to combine neoliberalism at home with protectionism against foreign competition, a position that breaks with the American establishment’s grand strategy of superintending ‘free-trade’ globalization. He’s threatening to impose tariffs on American corporations that move their production to other countries, has nixed the TPP, and intends to do the same to the Transatlantic Trade and Investment Partnership (TTIP) with Europe. He promises to renegotiate NAFTA with Mexico and Canada to secure better terms, and, in response to Chinese and EU protectionism, he threatens to impose a border tax of 45% on Chinese and others countries’ exports to the United States, measures that could trigger a trade war. Demagogic appeals to labor aside, Trump is doing none of this for the benefit of American workers. His program is intended to restore the competitive position of American capital, particularly manufacturing, against its rivals, especially in China and Germany. This economic nationalism is paired with a promise to rearm the American military, which he views as having been weakened by Obama. He wants a 9% increase in the military budget to build up the Navy and to modernize and expand the nuclear arsenal, even if that provokes other powers to do the same. Trump also plans to intensify what he sees as a civilizational war with Islam. This will likely involve ripping up the nuclear deal with Iran and widening the war on ISIS in Iraq and Syria. Viewing China rather than Russia as the main threat to this country, he also intends to create a more transactional relationship with the Kremlin. Hoping that he can split Russia away from China and neutralize it as a lesser power, Trump then wants to confront China with tariffs and military challenges to its assertion of control of the South China Sea. Corollaries of Trump’s ‘America First’ imperialism abroad are economic austerity and authoritarianism at home. Can his plans succeed? Almost all capital is overjoyed at his domestic neoliberalism, but sees his proposals of tariffs, renegotiation of NAFTA, and scrapping of the TPP and the TTIP as threats to their global production and investment strategies. The Democratic Party, rather than attacking Trump on his manifold reactionary policies, has portrayed him as Putin’s ‘Manchurian Candidate,’ insufficiently nationalistic, militaristic, and aggressive. Even if Trump weathers resistance from above and below, his foreign policy could flounder on its own internal conflicts and inconsistencies. To take one example: his policy of collaboration with Russia in Syria could flounder on his simultaneous commitment to scrap the nuclear deal with Iran, since Iran is a Russian ally in the region. The United States faces continued decline in the neoliberal world order, while China, even taking into account the many contradictions it faces, is benefiting from the current setup. That’s why, in an ironic twist of historic proportions, Chinese premier Xi Jing Ping defended the Washington Consensus in his country’s first address at the World Economic Forum in Davos Switzerland. He even went so far as to promise to come to the rescue of free-trade globalization if the Trump administration abandons it, declaring, ‘No one will emerge as a winner in a trade war.’ At the same time, China is trying to push out multinationals that have used it as an export-processing platform and replace them with its own state-owned and private corporations, which, like Germany, will export its surplus manufactured goods to the rest of the world market. Determined to challenge American imperial rule of the Asian Pacific, China appealed to states in the Asia Pacific region to sign on to its alternative trade treaty, the Regional Comprehensive Economic Partnership (RCEP) right after Trump nixed the TPP. Though its navy is far smaller than Washington’s, it’s also building up its regional naval power against Trump’s threats to block Chinese access to strategic islands in the South China Sea. All of this was underway before Trump. That’s why Obama initiated the pivot to Asia, deployed the US Navy to the region, and imposed tariffs on Chinese steel and tires. He also complained about NATO countries and others freeloading on American military largesse and encouraged Japan’s rearmament and deployments of its forces abroad. He even began the move to on-shoring manufacturing based on a low-wage America with cheap energy and revitalized infrastructure. There are countervailing forces that mitigate the tendency toward military conflict between the US and China: the high degree of economic integration makes the ruling classes hesitant to risk war, and because all the major states are nuclear powers, each is reluctant to risk armed conflicts turning into mutual annihilation. In this context, the Marxist theory of imperialism, which begins with the inherent contradiction between market globalization and the division of the world into competing national states, is essential to understanding the world today.” Smith notes here that Bernie Sanders’ foreign policy positions were/are “pro-imperialist. The emerging new Left must engage in principled opposition to all imperialisms and stand in solidarity with national liberation struggles like that of the Palestinians and revolutionary struggles like that in Syria, regardless of which imperial camp such struggles are in opposition to. This approach will be essential in the coming period that promises to be characterized by explosive struggle from below and intensifying struggle for global supremacy between the United States and China, amid other interstate conflicts. As Geier and Sustar wrote in their article, “the crisis in mainstream political parties amid the rise of Trump and the European far right on one side and the [Greek] Syriza, [Spanish] Podemos, and Sanders developments on the other is putting pressure on national ruling classes to find competent personnel who can develop a political program to manage the economic crisis, cope with intensifying class conflict, and navigate international rivalries and wars. To the extent that capital lets the far right off the leash to further scapegoat immigrants and minorities in order to drive a wedge into the working-class movement, we’ll be entering an extremely volatile period economically, politically, and ideologically.